Lake St. Louis is a city located in St. Charles County, Missouri. It has a population of 14,545 residents and rests on 7.91 square miles of land. The city of Lake St. Louis first began in 1966 when it was a private recreational lake community that was developed by Mr. R. T. Crow. In May of 1975 the community officially became a city. The city is considered a planned community and it offers home owners quality residential amenities that you won’t find in most places. There are two lakes within the city and also a beautiful 18-hole championship golf course, two par-3 nine hole courses, tennis courts, swimming pools, beaches, parks, and riding stables. For those who want a wide array of options of activities, Lake St. Louis is the place to be. There are three different shopping centers; The Shoppes at Hawk Ridge, The Shoppes at Lake Saint Louis, and The Meadows. Other amenities include The Family Arena, a National Equestrian Center, and minor league baseball teams. The median price per square foot is $124 and this is higher than St. Louis Metro’s median of $104. If you are interested in purchasing a home in Lake St. Louis, contact us today for more information. 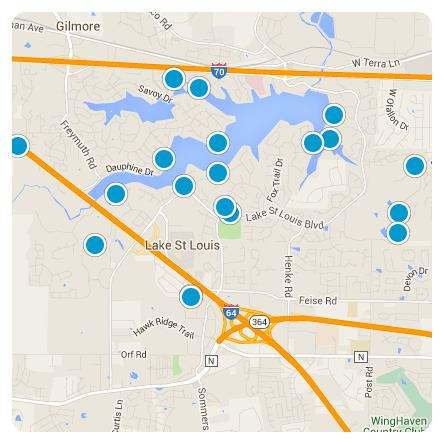 When you're searching for that perfect place to living in Lake St. Louis, try using some of these hints to make your search easier!